As Chairperson of the International Coordinating Committee, I convey warmest greetings of solidarity of the International League of Peoples’ Struggle to our esteemed member-organization Kilusang Mayo Uno and all the workers and people participating in your mass protest to celebrate the 114th International Day of Labor. We appreciate that on this day you are also celebrating the forthcoming 100th anniversary of the Great October Socialist Revolution. The ILPS has chosen the Philippines as the launching base of the international campaign to celebrate the October Revolution with many types of activities until November 7. We agree with and support your theme: “Workers and all toiling masses, unite! Fight imperialist control and plunder of the country’s wealth! Carry forward the national democratic struggle with a socialist perspective!” We welcome the focus of your protest on the fight against the escalating imperialist neoliberal attacks on workers and entire people. We agree with your urgent calls for the end of “contractualization”, promulgation of the national minimum wage, free public housing, free distribution of land and a just and lasting peace that is the result of addressing the roots of the current civil war with basic social, economic, political and constitutional reforms. You have a comprehensive and profound view of the problems in a semicolonial and semifeudal system ruled by the big compradors, landlords and bureaucrat capitalists who follow the baton of US imperialism. We are pleased that you exercise the right to assemble and speak out your grievances and demands. When there is a coalition or alliance with a certain administration, there must be unity and struggle among allies for achieving national independence, democracy, social justice, economic development and any goal that serves the people. The need for independence, initiative and vigilance on the part of the national democratic movement is greater when when this is faced with an “inclusive” administration that is a mix of the Left, Center and Right, still in the process of unfolding itself fully and therefore inconsistent in its positions and actions from one issue to another. US imperialism has been the chief instigator of the neoliberal economic policy on a global scale. The twisted logic of this policy is to promote production and employment by letting the capitalist make more profits and accumulate capital for reinvestment by pressing down the wage level, cutting back on social services, cutting down corporate taxes and personal income tax of the wealthy, liberalizing trade and investments, privatizing public assets, getting rid of regulations that protect labor, women, children and the environment and denationalizing underdeveloped economies. In maximizing profit by minimizing the wages for the working class, the capitalist class causes the crisis of overproduction. The market shrinks because of the the depressed purchasing power of the mass of workers and other people as consumers. Under the neoliberal policy, the government and its favored big corporations can tide themselves over economic busts by availing of public funds and credit abusively as if without limits. Thus, the economic and financial crisis recurs, worsens and protracts like the global depression which started with the mortgage meltdown in the US and other developed countries in 2007-2008. Economic and financial crises generate mass protests and inflame the class struggle between the proletariat and the monopoly bourgeoisie. The revolutionary parties and trade unions of the workers expose the root cause of the crisis in the system of exploitation. But the big bourgeoisie unleashes all kinds of propaganda to obscure its culpability. Worst of all, it uses state terrorism to suppress the anti-imperialist and democratic movement, steps up war production to increase the GDP and unleashes wars of aggression to replace and build up stocks of weapons. We are talking about the US and its NATO allies. These are killing and injuring millions of people, destroying means of livelihood and the social infrastructure and displacing millions of people in one country after another. And as the refugees flood Europe as a result of the wars of aggression, they are refused refuge by the European governments and the ultra-reactionary parties. But US imperialism, the No. 1 cause of the wars of aggression and displacement of people, admits the least number of refugees and employs harsh measures not only against them but also against recent immigrants. The superterrorist that explodes and threatens to explode superbig bombs spreads the fear of terrorist groups or cells (often created by the US intelligence services) as pretext for its own state terrorism. The strategic decline of the US is accelerating as a result of the high costs of its persistent economic and financial crisis and its wars of aggression. There are already manifestations of a sharpening class struggle between labor and capital in the US even as this is still relatively subdued by the still considerable economic and military power. US imperialism is despised on the widest scale among the oppressed peoples and nations. The addition of China and Russia to the ranks of capitalist powers has intensified the inter-imperialist contradictions and the drive to redivide the world. In the meantime, the US has already descended from the peak of being sole superpower and has to take into account the increasingly multipolar world. The workers and oppressed peoples and nations have suffered most from the conditions of the economic crisis and depression, the escalation of exploitation and oppression, state terrorism and the wars of aggression. To stop their suffering and aspire for a better and brighter future, they must wage various forms of revolutionary struggle. The workers of the world must unite and build revolutionary trade unions and parties of their class to wage class struggle against imperialism and all reaction and lead the anti-imperialist and democratic struggle of the broad masses of the people. The class struggle must be coordinated with the revolutionary struggle of the oppressed peoples and nations for national and social liberation in a common effort to create the conditions for a socialist future. Long live the Kilusang Mayo Uno! Long live the proletariat and entire Filipino people! Fight US imperialism and its local stooges! Advance the national democratic revolution with the socialist perspective! Long live the legacy of the Great October Socialist Revolution! Advance the world proletarian-socialist revolution! 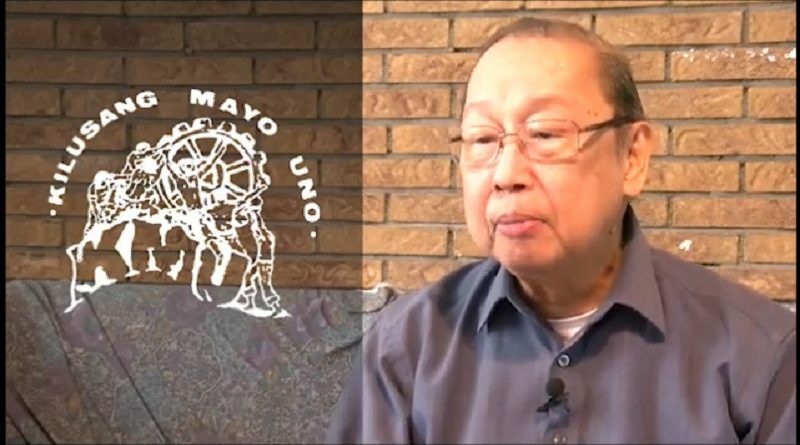 PANOORIN: Mensahe ni Propesor Jose Maria Sison, tagapangulo ng International League of Peoples' Struggles para sa Pandaigdigang Araw ng Manggagawa 2017.